The Wing’s in-house historian shares—and makes!—women’s history. It feels harder to come by a good history lesson once you’ve left school. To listen to the podcast or to attend one of Coe’s lectures is to learn about the striking histories of women whose lives have not received the same rigorous study, attention, or respect that their male counterparts enjoy. Even better, to have the opportunity to speak with Coe is to feel the immediacy of the stories she shares. What Should We Do: Could you tell me a little more about the Wing and how you got involved with the organization initially? Alexis Coe: The Wing is a network of work and community spaces for women. I came on a year before it opened as a consultant. [Cofounders] Audrey Gelman and Lauren Kassan had heard that I knew about social clubs, and so we had a breakfast not really knowing what would come of it. I had consulted on television series and movies before, but never really businesses. So I also went to the meeting sort of uncertain. But I told them two of my favorite stories about women’s social clubs, which has always been one of my many side interests from grad school. They were really engaged with the material and we just kept working together. When the Wing opened a year later at the first location in the Flatiron, the title of “in-house historian” organically came about. I’m not actually in-house. I’m not a permanent employee. Our relationship is collaborative, and the latest iteration has been the podcast No Man’s Land. WSWD: Before we jump into No Man’s Land, what exactly does it entail to act as the resident in-house historian for an organization like the Wing? Coe: A lot of different things. Besides No Man’s Land, I chose the women [to be artistically interpreted] for the wallpaper for various locations. I’ve hosted panels sponsored by Madewell, Amazon, and Chanel. I have given monthly lectures. I’ve written speeches for Audrey. I’ve consulted on different launch activities. It’s really all over the place. It’s fun in this way that there are constantly new ways to meet the challenges. They’ll come to me with various requests, and it’s a great opportunity to use the knowledge that I have in different ways than I normally would. I work across a lot of mediums but, you know, wallpaper was a new one for me. I work across a lot of mediums but, you know, wallpaper was a new one for me. WSWD: Sounds like you get to wear a lot of hats. Coe: Yes. And it’s really new, because with the wallpaper, for example, I got to work with artist Joana Avillez and give her these ideas and talk to her a bit about the various women—and then to see what she actually created. And they’re very different. Ruth Bader Ginsburg, for example, is on the wallpaper. And then at the Washington, D.C., location, Joana ended up being inspired—I talked to her about monuments—and so [the women] are presented as monuments. For me it’s so exciting to see how the knowledge is used in different ways. WSWD: Beyond the Wing’s physical space, it’s exciting for someone like me who doesn’t have a membership to have access to the podcast…it’s like a peek inside a secret club. Coe: I was happy about that. I did an Audible podcast called Presidents Are People, Too, and while there was initial talk of it being free, it wasn’t. It was only free for Amazon members, and that wasn’t well advertised. People on Audible only knew about it. And that made me really sad. But the Wing, from the very beginning, wanted it to be public—which is lovely, because whenever I host a panel or give a lecture there, I would see a lot of side tweets saying, “I wish I could go, but I don’t live in the area” or “I’m not a member.” And this is reflective of the kind of history that I would present at the Brooklyn Historical Society; it’s very similar. This, of course, is also produced by Pineapple Street Media, so it’s wonderful. It produces Missing Richard Simmons, as well. It’s Ann Heppermann, the producer and Peabody winner, so it’s quite polished. It’s really me at my best, enhanced by Pineapple. I think that having the first offering from the podcast be about women’s history is a wonderful way to do away with misconceptions about the Wing being exclusive or for a certain type of woman. It’s probably not what people expected—and I think that speaks to, in particular, Audrey Gelman’s belief in me and in what I bring to the Wing, and how people have responded. It’s not necessarily this obvious idea anywhere. I would often be called in to magazines or television studios. They would say, “We love what you do, but we want it to be this way” or to be really different than what I wanted to do. 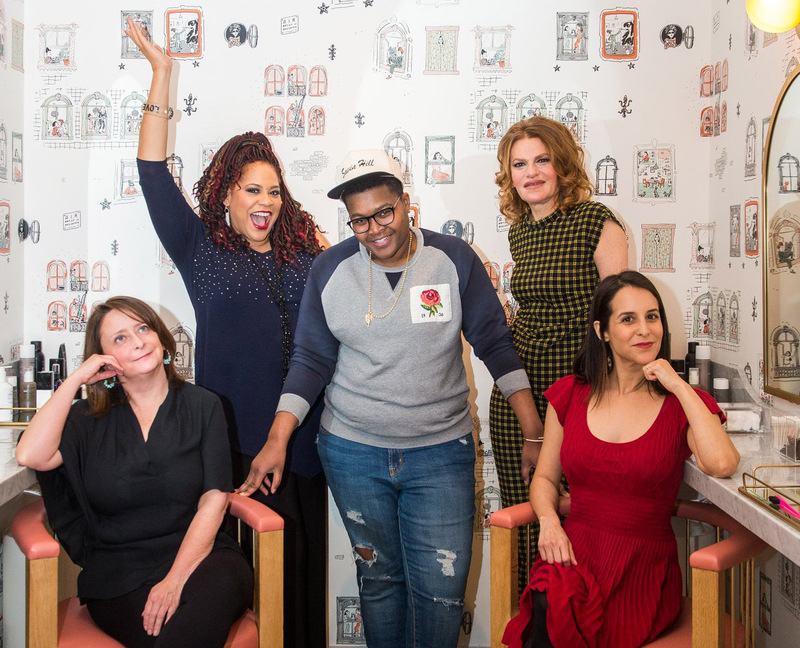 And so to be able to present, in six episodes that took a year to make, women’s history at its height in every way—the content; the sound; the ability to get guests ranging from Ida B. Wells’s great-granddaughter to Sylvia Plath’s best friend from college to Jessica Ramos, representative-elect from the New York State Senate—has been a dream come true. I always consider how the woman herself would want her story to be told. I believe her, and I also want to understand why there are contending beliefs about her. WSWD: The length of the podcasts—about a half hour each—makes it feel as if we’re really able to linger a bit longer with each of these women and have a sense of them as fully rounded characters in history. Sylvia Plath, for example. I read The Bell Jar in high school and had a basic summary of her as a great, depressed writer with a terrible, unfaithful husband. Your episode really fleshed her out. Coe: Thank you. The goal is to make sure that there is foundational knowledge without it sounding like foundational knowledge, because that is boring. And at the same time to address what is most important with each subject. For Plath, in particular, people only knew that she killed herself. And maybe anything past that was the sensationalistic interpretation of the poem “Daddy” or that she wrote The Bell Jar, which again was interpreted as wholly autobiographical but in novel form. And for that I really wanted to give her greater context and flesh her out. With people like Ida B. Wells, there was such a specific story I wanted to tell. We know that she’s a genius. We know that she was the leader of the antilynching campaign in America. But how does that happen when you’re 29 years old? I wanted to focus on a form of history so that we understood how she came to this realization, what happened to her, what she experienced, and what that meant for the rest of her life. And then, you know, the most exciting thing is there are people to fill in the blanks around there. But through and I through, I would say that I always consider how the woman herself would want her story to be told. If I’m not doing that, if I’m straying from that, I really have to believe that it’s important and it’s true, and that it will serve her as much as the listener. It’s a matter of balancing two things out. I believe her, and I also want to understand why there are contending beliefs about her. WSWD: Is it difficult for you to research these kinds of questions? Do you find that you run into gaps in the archives, or rather is there a wealth of information that hasn’t been mined or disseminated to a wider audience? Coe: It depends on the woman. With Plath, the information is there. It’s just been told by men for too many generations—that’s simply true. Men have a tendency, particularly in the time in which she was most active, to dismiss women as hysterical. Other times the information is not so easy to get at. Something that would work for a blog post doesn’t work for a 30-minute episode. I have to go outside of the archives for a podcast, but that’s always where I begin in every full episode. The archives have been exhausted or at least heavily consulted. The advantage of a podcast, and certainly with a producer and a booker, is that we can speak to descendants. We can speak to people who live in the area. We can speak to people who have done extensive research, to people who disagree with each other. It makes for a really interesting conversation. At the same time, I would say that that is a mix of forces that I would look for no matter what medium I’m working in. But you can’t interview an archive, unfortunately. WSWD: Have you always been interested in history? How did you choose this profession? Coe: When I was in college, it’s sort of funny, I was obsessed with Irish literature. I wrote my undergraduate honors thesis on gender roles in Ulysses. But I found that to understand Irish literature, you really needed to understand Irish history. So I started to get into history as well in my sophomore year. In order to enroll in some of the classes, I had to satisfy a minor in history. A lot of that had to do with introductions to world history, to American history. And to my great surprise, I really loved American history. I ended up double majoring in English and history. I just loved it, and was sort of not meant for the real world in a lot of ways. So I got a graduate degree. At the same time, though, when I was in graduate school studying American history, I was often frustrated by the limited engagement that I saw between professors and their ability to disseminate their work to the real world. I don’t like to write papers for five people that one very important person will declare important but that no one else will ever read. I think that the sentimental part of just following your passion and working as hard as possible will always reveal something great. WSWD: So how did you translate your degrees into the real world? Coe: While I was in grad school, I lived in Brooklyn Heights near the Brooklyn Historical Society, and I didn’t quite understand how public institutions functioned. But I figured I had a good package, so I walked in to offer my services for free, hoping they would take it—and they did. That was sort of the end for me, because at the end of my academic career I loved the way I could do oral histories, go out into the world, and then input them into the Library of Congress for people in the public domain. Soon after I finished my master’s and was really pointedly working on a Ph.D., I got a job at the New York Public Library. So I took a big leap and left academia. From there, I wrote a book called Alice + Freda Forever, which is going to be adapted for the screen by the writer and director of The Babadook. It will come out in 2020. Coe: I just love what I do. And I’m fortunate to do something that makes me really happy. It’s very difficult, but it makes me feel satisfied with my professional life and personal life. And I’ve been able to do it in all sorts of interesting ways by pursuing my passion for history. I do know that this is not a common path, and I sometimes feel a little bit lonely on it. But it is not impossible, and I think that the sentimental part of just following your passion and working as hard as possible will always reveal something great. That’s how I ended up here.